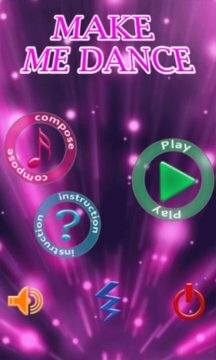 "Make me dance" is a music game in which you can experience the most famous dancing song from 80s to now by touching quickly on a colorful dancing floor. Each time you pass a song, you can recompose it as the way you like to experience again. This game is heavy a bit because of the songs inside. If you like this game, plz, rate this! Thanks for downloading my game! UPDATE 1: fix crash game or no balls appear when playing due to the difference of region format. UPDATE 3: some fixed bug in compose screen, and 3 more new songs was added in this update, enjoy! UPDATE 4: fix stutter/lagging problem when too many stars shot out. Especially, ads are removed from most gaming screens.